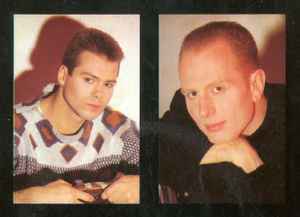 London-based art-pop act who debuted as a traditional five-piece band but by 1985 had been reduced to a duo, Simon Toulson-Clarke (vocals, guitar) and Julian Close (keyboards, programming, saxophone). That year saw them achieve the first of two UK top 10 hits with the anthemic "Lean On Me (Ah-Li-Ayo)", followed in 1986 by an ambitious album "The Circle And The Square" on which the duo's sound was augmented by a small army of guest musicians, and from which was lifted a second hit "For America". Put out of action for a while by contractual disputes, Red Box finally returned in 1989, with Close replaced by Alastair Gavin. The second album "Motive" suffered from a lack of promotion and Red Box officially "retired" soon after.